As home to one in six of the world’s population, with a highly complex ethnic make-up, 1,600 languages,1 a third of the world’s poor,2 43% of its children under-nourished,3 and the fourth largest number of billionaires in the world, 4 India confounds all expectations. But India enjoys a rising global profile, and with that comes heightened responsibilities. The big ideas of our times, from global development goals, to environmental protection, to human rights, will succeed or fail based on how countries of India’s stature deal with them. We all have a stake in India. That is why we must not ignore one of the largest global scandals of all, which persists within its borders, and which fuels exploitation and poverty – a pervasive social hierarchy based on birth, which treats 167 million people as outcasts. These are the Dalits. If a group of 100 people represented the population of the world, five would be Americans, three would be Indian Dalits. They form the ‘bottom’ of India’s caste system, below the four main ‘varna’ groups. ‘Dalit’ means ‘broken’ or ‘crushed’. It is the name chosen by these ‘untouchables’ of old, and it represents their sense of a history reverberating with oppression, exploitation and injustice. Dalits are the worst victims of what is arguably the most tenacious hierarchy on earth. The caste system has ancient roots, and became a means of social stratification, in which ‘low’ castes were expected to perform dirty, degrading and dangerous tasks for the rest of society. Caste has been described not as a means for the division of labour, but for the division of labourers. Although associated originally with Hinduism, the caste system is practised across all religious communities in India today. It may be tempting to forget the caste system and focus on India’s economic boom. However, the two cannot be separated so simply. Much of India’s economic infrastructure is overlaid on this ancient system of hierarchy and obligation. Caste is deeply-embedded, not only in the rural areas which almost never intersect with modern, trendy, industrialising India, but also in the fast-growing urban centres. In the past, Dalits had to ensure their shadow never fell on non-Dalits, so as not to pollute them. It is not quite like that today. But Dalits are still treated as untouchable in myriad ways. This exhibition exposes, through a series of portraits, what it means to be untouchable in an emerging superpower. 1The 1991 census recognised 1,576 “mother tongues”. 2‘DFID India Country Plan 2008-15’, p. 2. 4Forbes magazine, ‘Special Report: The World’s Billionaires’, 3 March 2010. Being untouchable has no place in our world. With its many different facets, there is no single solution to the plight of Dalits. However, Dalits plead for their cause to resonate worldwide, like apartheid in South Africa. ‘Untouchability’ was banned in India’s Constitution, but as Dr B.R. Ambedkar, architect of India’s constitution and Dalit icon, once said, “It will take more than a law to remove this stigma from the people of India. Nothing less than the aroused opinion of the world can do it”. The Indian Government has taken some remedial measures to address the social exclusion of Dalits, and the current political leadership has repeatedly stated its commitment to combat caste-based discrimination. However, much more needs to be done. Global corporations investing in India can play a role, by implementing the ‘Ambedkar Principles’, which set out how to comply with the UN Global Compact with special sensitivity to caste. Corporations must ensure all their supply chains are entirely clear of labour exploitation, for demand increases supply, and Dalits are the most susceptible to labour exploitation. They should take responsibility in hiring practices, to ensure Dalits are not excluded from employment because of the structural disadvantages faced by their communities. India’s global partners can play a role. 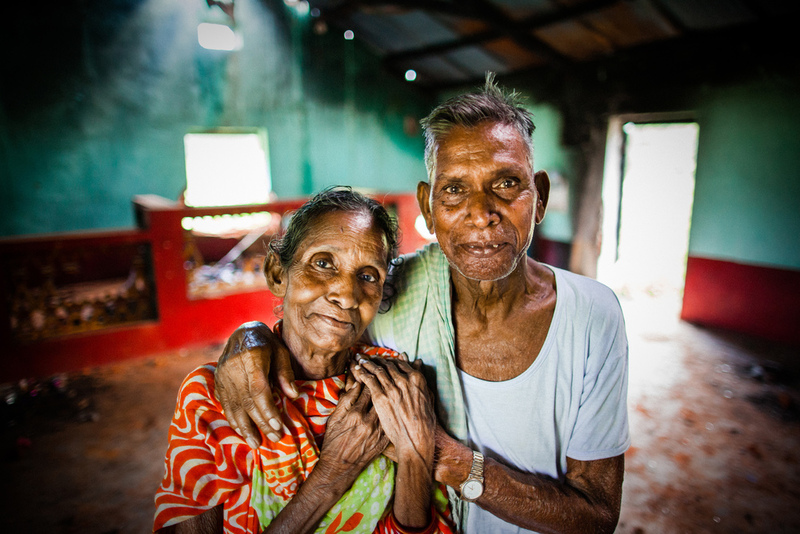 The UN has charged the Indian Government with demonstrating clear progress to tackle the many different forms of caste-based discrimination, and this message needs to be reinforced by fellow UN member states. Foreign aid and development policies, too, should specifically tackle the structures that support social exclusion, especially caste-based discrimination. It is up to us to see that this happens. Don’t forget the Dalits. Marcus Perkins and David Griffiths wish to express their great thanks to each of the subjects of the photographs, for their hospitality and for openly sharing their lives with us. We are also extremely grateful to very many people for their generous assistance with the project. They include: Minesh Amin, Harish Arisalya, Indira Athawale, Penny Ayres, Jill Coombe, Dataram, Tom Fewell, Ganesh, Sarah Griffiths, Emma Howlett, Solomon Isaac, Ajay Kumar, the late Kamal Kumar, Manohar, Ashish Missal, Sam Paul, Sarah Perkins, Liz Pruett, Udit Raj, ‘Auto’ Raja, Bama Raman, Tina Ramirez, Chabinath Shiply, Ajay Kumar Singh, Madhu Chandra Singh, Meena Varma, Bezwada Wilson, and Angela Wu. Others preferred to remain unnamed, but we gratefully acknowledge their contributions also. Right: Devamma was our host when we visited her community. She cooked for us and allowed us to use her home as a base during our stay. 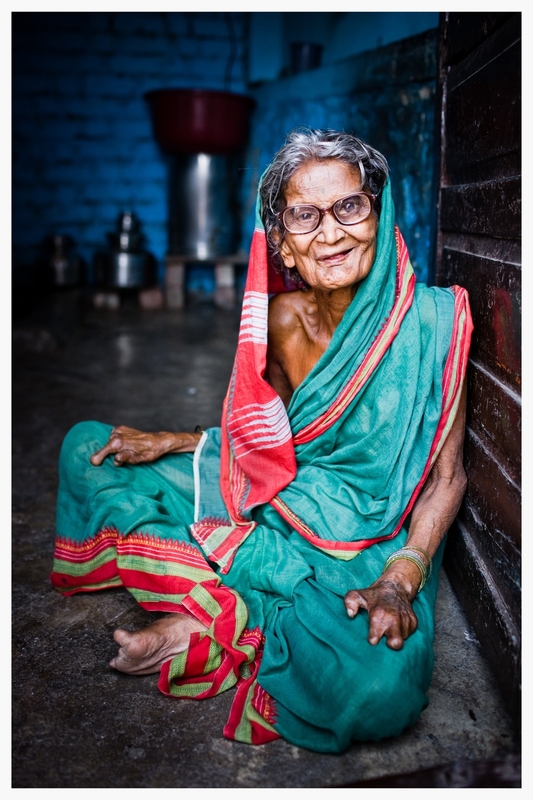 Devamma has lived with leprosy for more than 40 years. CSW, a human rights NGO specialising in religious freedom and related human rights issues. Injustice, poverty and inequality suffered by many of India's 167 million Dalits (Untouchables). Being Untouchable was envisaged as a tool to raise awareness of the diverse forms of suffering experienced by Dalit communities in India, and as a launch-pad for advocacy initiatives. 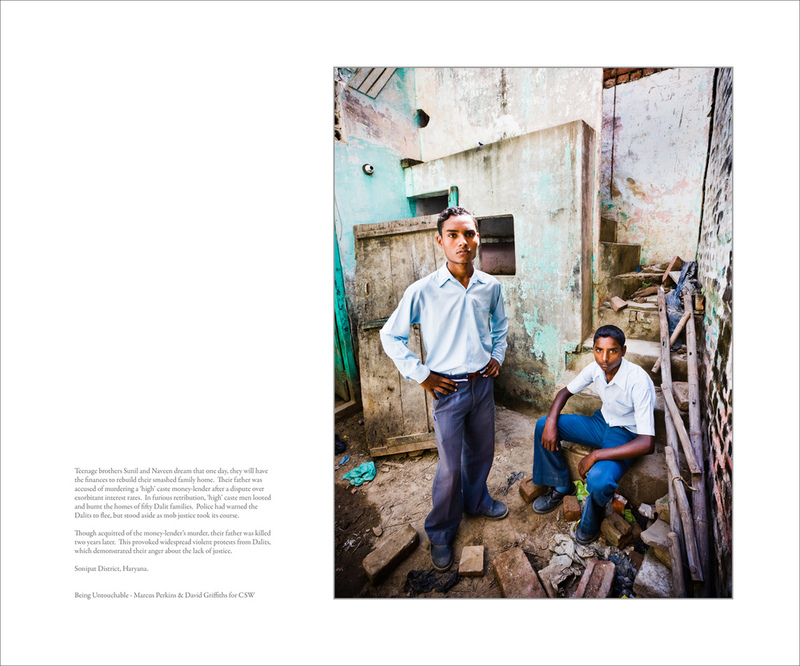 The project delivered an intimate series of portraits of the lives of Indian Dalits supported by authentic, well-researched and verifiable background information. Launched at HOST, a leading photojournalism gallery in October 2010, the project has been featured in Prospect magazine, the New Statesman, and in the centre page Eyewitness feature by the Guardian. The project was also featured by BBC Online News as a front page linked story, a picture gallery and as a film report. In February 2011 the European Parliament used the project's signature image to highlight caste-based discrimination in South Asia. The exhibition moved to St Paul’s Cathedral in June-July 2011 for for a five week run - which coincided with the cathedral's 300th anniversary, and a visit by HM Queen Elizabeth II - where it was viewed by an estimated 90,000 people. In 2017 the project was published in the 20th anniversary edition of Gallerie Magazine, a double issue focusing on peace and hope. Today the photographs continue to be used as signature images by Dalit support and activist organisations around the world.